A kit composed of 3 unique realistic chemical warfare agents (CWA) simulants, ideal for CBRN training and courses. 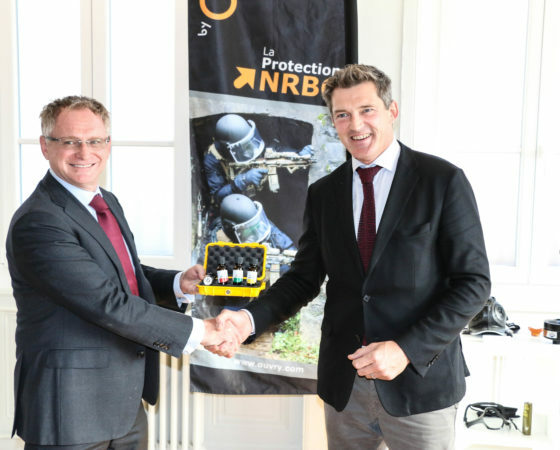 French company Ouvry, specialist in CBRN (Chemical, Biological, Radiological and Nuclear) personal protectives systems, announces that it has acquired SIM KIT® patent from Dutch Hotzone Solutions Group. This chemical simulant kit is intended to be used in CBRN training and courses. SIM KIT® was launched and patented in 2012 by practitioners, former instructors from the Organisation for the Prohibition of Chemical Weapons (OPCW) and is used in over 20 countries. Ouvry already had an exclusive distribution agreement for the French market. Hotzone Solutions Group now wants to focus on its core activity: instruction, consulting services and supply of integrated systems (mobile laboratories, CBRN risk assessment and categorization kits).